Kombucha is an acquired taste. The fist time many of my friends cautiously tried my mysterious muddy brown, effervescent drink with clumps of unidentified particulate bobbing on the surface, they winced and said it tasted too acidic. But for those who enjoy this 2000 year old traditional drink, buying it at the the local health food store can be costly, around $5 for a measly 16oz bottle. Yet, brewing it yourself is quite simple and will cost you a fraction of the price. Kombucha’s health benefits have not been proved by western science, however, kombucha may support the immune system, improve digestion, and help prevent cancer. Kombucha has been brewed for over 2000 years, probably originating around 212 BC in China during the Tsin dynasty, when it was called the tea of immortality. Since then, it has been brewed around the world in Russia, India, Japan, and Germany to cure and prevent various aliments. A note on the water and tea: You can filter the water through a Brita filter or boil the water and let it simmer for 10 minutes on the stovetop. As for the tea, I find plain green tea tastes the best, but you can use black, white, or red tea, whatever you prefer. Don’t use flavored teas like Earl Grey or English Breakfast. Where to find a scoby: The “scoby” is the symbiotic yeast and bacteria colony that ferments the tea. You can either re-use the scoby (the floating particulate) from a store-bought kombucha, or you can buy one off of craigslist or other websites. If you are buying off of craigslist, be sure to bring a glass container to keep the scoby in. It is alive and plastic will kill it. Make tea to fill your jar. Remember the scoby is living, so using unfiltered water or flavored tea will kill it. Make sure to use organic sugar and tea. Dissolve the sugar in the tea before it cools. Let the tea cool. Add the tea, the scoby, and the store-bought kombucha to the jar. Cover the jar with the cloth and secure with a rubber band. Store the jar in a cool, dim area. Let the scoby grow! You will see the scoby grow in size, feeding off the sugar in the tea. It will resemble a large pancake floating at the top of your glass jar. 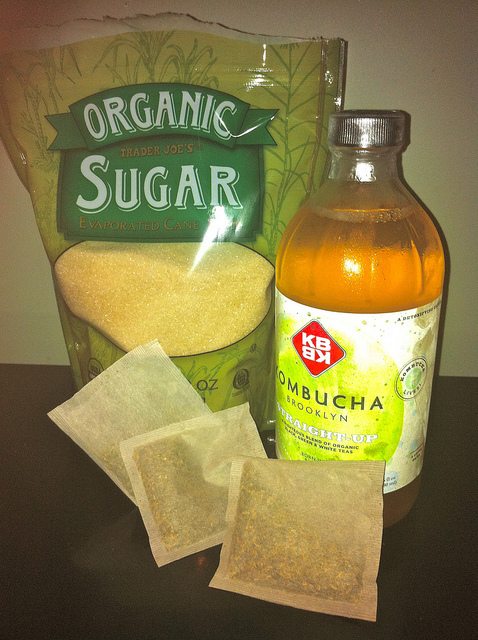 After about a week, start tasting the tea with a spoon to brew your kombucha to your preferred acidity. The longer it ferments, the more acidic or vinegary it will taste. I usually let my tea ferment for 1.5 weeks. Pour your tea into glass bottles that will keep the tea sparkling, like these. I usually let my tea sit in the bottles for a couple days to increase the bubbliness. Add flavorings such as juice or nectar to the tea in the bottles if you want to. I personally like adding mango juice. To start a new batch, first you must remember that the scoby is a living organism. Once you bottle your tea, make another batch soon after so the scoby does not die. When the scoby grows too large in size, you can pull it apart and give its “babies” to your friends or throw them away. However, you don’t need to buy a new store-bought kombucha for each batch. Instead save about 2 cups of tea from your previous batch to add to your new one. Cheap NFL Jerseys, kids nfl Jerseys, Womens Jerseys,Wholesale NFL Jerseys Online, Authentic 2012 New Style, Wholesale and Custom, Fast Delivery! Thanks for another informative web site. The place else may I get that type of info written in such an ideal manner? I have a challenge that I’m simply now running on, and I’ve been at the look out for such info. I do not even know how I finished up right here, however I believed this put up was good. I don’t recognize who you’re however certainly you’re going to a famous blogger should you are not already. Cheers! Wonderful goods from you, man. I have be mindful your stuff previous to and you’re simply extremely wonderful. I really like what you have acquired here, certainly like what you are saying and the way through which you assert it. You’re making it entertaining and you still take care of to keep it wise. I can’t wait to read far more from you. This is really a great website. and it’s time to be happy. I have read this post and if I could I want to suggest you some interesting things or advice. Maybe you could write next articles referring to this article. I want to read more things about it!